This is a healthy recipe because it is a great replacement for alternative snacks, like chips, cookies, or movie theater popcorn. 1. Preheat oven to 375°F. Line a baking sheet with parchment paper or a Silpat silicone mat. 2. Drain and rinse the chickpeas in a colander. Place them on a towel to dry off. 3. Spread chickpeas on a baking sheet in a single layer. Bake for approximately 45 minutes or until crispy. Test one, and if it's still soft, bake for longer. 4. 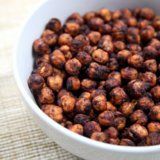 While the chickpeas are still hot, toss them in a bowl with the oil, honey, cinnamon, nutmeg, and salt. Enjoy as is, or for a caramelized effect, place them back in the oven for another 10 minutes or so. 5. Store leftover chickpeas in an airtight container.